How does one approach processing his or her memories of tragic events of his or her past? Does grace exist and triumph even in the middle of life’s darkest tragedies? Is God silent in our pain and suffering? 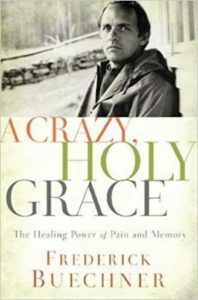 These are just a few of the questions that Frederick Buechner seeks to wrestle through in his book A Crazy, Holy Grace: The Healing Power of Pain and Memory. For Buechner, the painful memory that haunts him and that he seeks to process through this book is the suicide of his father when Frederick was a young boy. This was an event that was rarely if ever discussed within Buechner’s childhood home and was something that Frederick didn’t even personally process until he was an adult. Suffering, tragedy, and pain are things that mark and define the lives of many people. In the seeking of hope and grace in the midst of tragic memories, Buechner’s book is a thoughtful and encouraging resource. Though he doesn’t answer every question that he raises, though who truly can this side of heaven, Buechner calls his readers to press into hope. A hope that is greater than the pain that could define a reader’s past.